After Israel Adesanya and Kelvin Gastelum had what was one of the greatest fights in UFC history on Saturday night in Atlanta, moments later, when the awe subsided, the immediate reaction was we still have another great fight to come. Given the number of fights in a year, the odds that two fights on the same show that took place consecutively would finish 1-2 for fight of the year when 2019 is over would normally be something like 500-to-1 or greater odds. But when the second fight involves Dustin Poirier, those odds dropped dramatically. 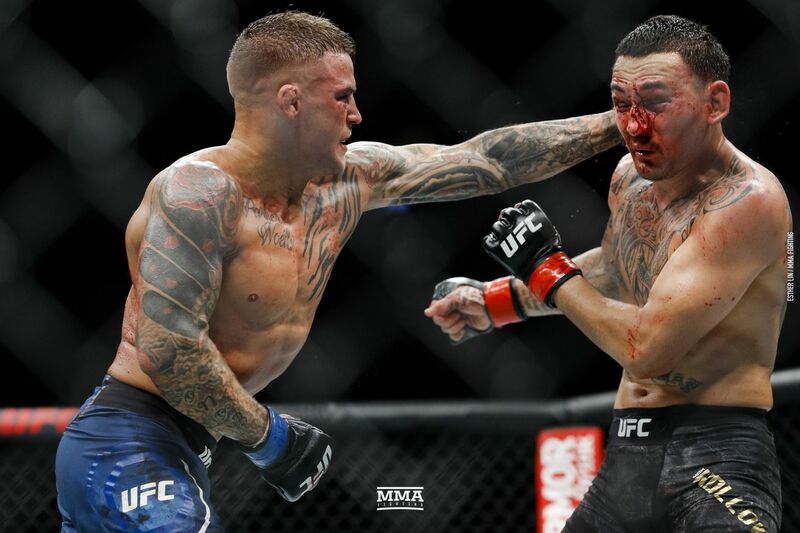 Poirier and featherweight champion Max Holloway followed with a fight that was of the same caliber to the point many had it as fight of the night. In doing, Saturday’s UFC 236, which until Gastelum and Adesanya got into the cage felt no different than any other Saturday night show, is now the favorite for best show of the year. It very well could be the best consecutive fights in UFC history. If asked that question before Saturday, I’d go with the duo of Wanderlei Silva vs. Cung Le and Dan Henderson vs. Mauricio “Shogun” Rua at UFC 139 in 2011. I’d choose the top two fights at UFC 236 now. UFC President Dana White had every reason to gloat when the show was over. He took the position that these fights vindicate the decision for almost constantly creating interim championships. To an extent, there is something to that. On one hand, the titles were hardly necessary in the sense the actual champions, middleweight champion Robert Whittaker and lightweight champion Khabib Nurmagomedov, are both expected to fight in a few months. Both fights could have just as easily been called title eliminator fights, which they were. But given UFC rules, that would mean Gastelum vs. Adesanya would be a three-round fight, since Poirier vs. Holloway, title or not, would have been a five-round main event. With the benefit of hindsight, Adesanya and Gastelum was far better with the added two rounds. There are advantages in that the longer fights, while much harder to train for and harder to get through, have the ability to also be far more dramatic. The other key point is that UFC has created the expectations that a pay-per-view show needs a title fight. And this was a pay-per-view show. And two “fake” titles is superior to one, at least for the night. The reality has shown, with so many injuries and timing issues that even with 12 championships and the idea fighters fight multiple times per year, that there are big monthly shows where you simply don’t have a championship fight available. That wasn’t the case here. Holloway, the featherweight champion, was on the show. He could have defended his title against Alexander Volkanovsky. But that’s the marketing aspect of the game. Interim titles as a rule don’t draw well because the public doesn’t take them as real. They are so overdone, and often meaningless, given the times interim champs don’t even get the next title shot and are forgotten about. But in this case, the story of the dominant featherweight champion on the third-longest winning streak in company history (13 fights), moving up to face Poirier was bigger than a title defense against Volkanovsky. But instead of these interim belt that come-and-go, perhaps an idea would be to create secondary belts in weight divisions. The negative is that the more championships there are, the less they mean, a lesson where that line was crossed long ago in UFC. But permanent secondary titles, regularly defended and used to create the top contender in a weight class, whether you want to call them International, Intercontinental or some other term, at least would have an historical purpose. The positive is, in the modern era you would know have a plethora of titles and champions. Of course, that’s one step toward boxing, where the alphabet soup championships are generally meaningless to the public and it’s about name value, not belts. The second is that the secondary champion should be the top contender for the main title. That’s great for a pure sports perspective, but fighting sports have never been and may never fit that category. Promoters try to deliver fights the public wants to see. Then again, Colby Covington was interim welterweight champion and Kamaru Usman got the shot at Tyron Woodley anyway. But if there are going to be championships, they should be regular existing titles with a history and a lineage as opposed to what people joke are made up belts. At least the belts wouldn’t come and go, have no historical importance or significance, and are belts won but rarely if ever defended. Another issue with Saturday’s show was during the Matt Frevola vs. Jalin Turner fight. During the second round, Frevola threw an illegal up kick, since Turner was a downed opponent. No penalty point was called because the ref thought it was a glancing blow. When watching the replay, everyone could see it was anything but a glancing blow. Unfortunately, there are two major flaws in the current rules that apply to this. In some states, if the referee was to look at a replay, the match has to be over. There was no reason to stop this fight, so the ref was not allowed to check and see what everyone watching on television could easily see and recognize the ref’s judgment wasn’t correct. In 2019, that feels like a sport behind-the-times. Worse, there are places where the ref can’t even look at tape even after a fight is over to render a judgment. Obviously, as the sport evolves, two things are necessary. One is the same rules in every state. The other is rules that allow for referees to make the right call in situations where maybe they didn’t have the best angle. Of course, as we’ve seen when it comes to rules, progress comes very slowly, and at times, changes are made that aren’t always progress. Let’s look at how fortunes changed for five stars of Saturday’s show. DUSTIN POIRIER – Poirier (25-5, 1 no contest) has now run up a streak of six straight classic brawls. The Holloway win comes on the heels of two bouts with Eddie Alvarez, and one each with Justin Gaethje, Anthony Pettis and Jim Miller. In that run of name opponents, Poirier has five wins and a no-contest. There’s no denying he’s deserving of a lightweight title shot next. There’s also no denying Tony Ferguson deserves the same thing. Ferguson has his personal issues to deal with. And there’s also Conor McGregor, who doesn’t deserve a title shot just yet, but when it comes to business, means so many dollars that he’ll have every advantage in getting such a fight. After this win, Poirier and Nurmagomedov (27-0) should be one of the big fights of 2019. But there are tens of millions of dollars in reasons why he may be overlooked and McGregor would get that shot. In that case, Poirier has no shortage of opponents to defend his interim title against. The key ones would be a Justin Gaethje (20-2) rematch or the winner of the May 4 fight with Donald Cerrone (35-11) vs Al Iaquinta (15-4-1). If Ferguson (24-3) was ready, he’d actually be the first name on that list. MAX HOLLOWAY – Holloway (20-4) had dominated the featherweight division. Poirier, his opponent, was also a featherweight who had great success moving up to lightweight. The difference is Poirier packed a lot of muscular size on his body, while Holloway, even though he cut heavily to make featherweight, physically still looked more like a featherweight in the cage. Holloway was faster and more skilled than Poirier. While the fight was competitive, it was clear from round one that lightweight punches from Poirier were hurting Holloway more than featherweight punches had, and his punches were not hurting Poirier like they had hurt his featherweight opponents. White after the fight tackled about Holloway moving back to featherweight, a judgment call that seemed obvious during the fight. Volkanovsky (19-1), should get the next title shot if he can beat Jose Aldo (28-4) on May 11 in Rio de Janeiro, Brazil. If Aldo wins, given Holloway has beaten Aldo decisively twice, the leading contender should be Zabit Magomedsharipov (17-1). Frankie Edgar (23-6-1) would also be in the running, depending on how quickly he can return from a torn biceps suffered in October. ISRAEL ADESANYA – At 17-0, the Style Bender has one of the most impressive records in the sport among those who have fought at the top level. Gastelum showed Adesanya is far from unbeatable. But he also showed Adesanya is also far from a front runner, in the sense when the fight was on the line going into the fifth round, it was Adesanya who shined. KELVIN GASTELUM – Although Gastelum (15-4, 1 no contest) lost on Saturday, that fight was the textbook example of a fight where, to the public, there was no loser. Yes, Gastelum is hurt because with a win, he’d be the one getting the shot at Whittaker. But at the same time, he made himself a fighter that the public has more interest in seeing again. His next fight should be against either Yoel Romero (13-3) or Paulo Costa (12-0), who are likely to be fighting each other first. A lot depends on timing. He could face the winner in a fight to determine who faces the Whittaker vs. Adesanya winner. If Costa fights and beats Romero, then Costa vs. Gastelum makes sense. If Romero fights Costa and wins, given Whittaker has two wins over Romero, Romero vs. Gastelum makes sense. If Adesanya wins and Romero wins, Adesanya vs. Romero should be the clear direction. NIKITA KRYLOV – Krylov (25-6) got a second-round submission over an exhausted Ovince Saint Preux (23-13) on Saturday. Krylov should be used next to determine if fighters on the rise have the goods to be in the light heavyweight title picture. The three best candidates for that spot are Dominic Reyes (11-0), Jim Crute (10-0) or Johnny Walker (17-3). Krylov can put himself into a strong position with a win over any of those fighters, while they can all take a step toward the top with a win over Krylov.